Father of Henry Bernard Feldhaus Jr.
Married on 6 November 1849 Maria Catharina Holstiege, born 15 September 1821 in Roxel, Germany to Johann Heinrich Holstiege and Theresia Wulf. She died 10 February 1901 in Wesphalia, TX. Both are buried in St. Mary's Cemetery, Westphalia, TX. This Feldhaus family came to the U.S. from the town of Roxel, outside Munster Germany, in the Province of Westphalia (Westfalen) where they had lived for hundreds of years. They attended the Pantaleon Catholic Church in Roxel. While his son, Henry Bernard Feldhaus, Jr., eventually settled in Lawrenceburg, TN, he and his wife and daughter stayed there until 15 August 1884 when they moved to Texas where they eventually settled in the small town of Westphalia, TX between Dallas and Austin, just below Waco, TX. See more about Wesphalia, TX below. The map below is interactive. You can click on the icons on the map for more information and move the map around or enlarge or shrink it. Enjoy! 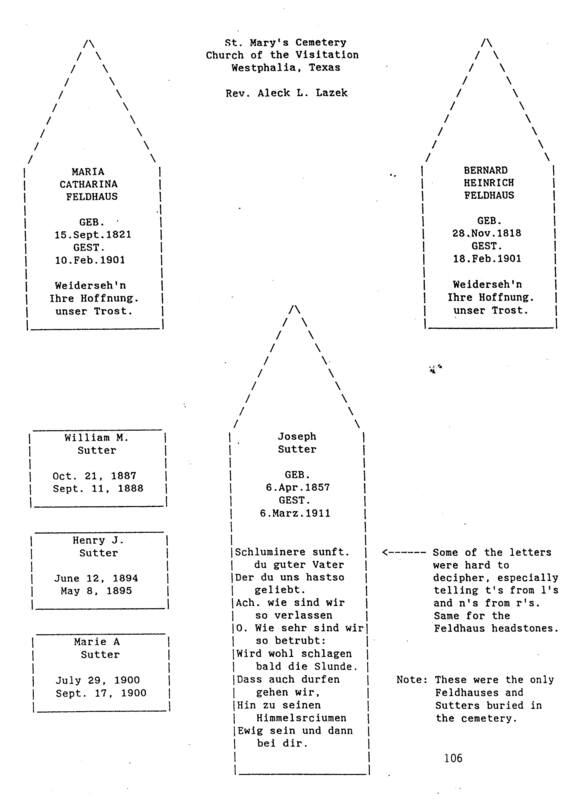 According to Kathleen Sudduth Niedergeses, who obtained this information from the church they attended in Germany, Bernard Heinrich and Maria Catharina Holstiege Feldhaus had two children who were born in Germany and died in Germany at a young age. Bernard Anton Feldhaus was born on 5 June 1852 in Roxel, Munster, Germany, and baptized on 5 June 1852 by the church Chaplain Schafmann. He died on 29 May 1863 in Roxel, Munster, Germany, and was buried on 1 June 1863 in Roxel, Munster, Germany. The cause of death was typhoid fever. Catharina Elisabeth Feldhaus was born on 24 September 1854 in Roxel, Munster, Germany, and baptized on 26 September 1854 in Roxel, Munster, Germany, by the church Chaplain Baune. She died on 9 May 1862 in Roxel, Munster, Germany, and was buried on 12 May 1862 in Roxel, Munster, Germany. The cause of death was scrofula – a disease affecting tissues in the young causing them to be susceptible to consumption, swelling of glands, etc. There were two ships named SS Hermann. According to the web site http://www.rieperoots.com/MYPAGES/ships-main.html this is one of them. 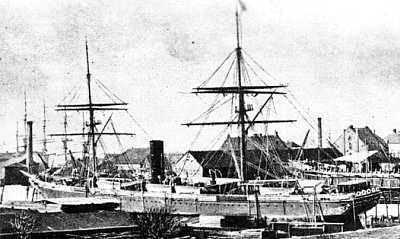 However, it differs from the description below in that it has two funnels and three masts. This sister ship, the SS Deutschland, was built a year later and sailed the same route as the SS Hermann described below and looks closer to that description. Bernard Heinrich Feldhaus came to the US from Germany aboard the ship SS Hermann, arriving at Castle Garden, NY on April 27, 1868. His occupation was listed as Maurer (Bricklayer) . According to Clara Feldhaus, his father was a butcher. However, his army records indicate his father was a weaver. Click here for a typed version of the complete ship's manifest. They left Germany on April 11, requiring 14 days to make the passage. We have heard that they came to the US so their son would not have to fight in the wars of German unification that Bismark was undertaking at that time. He was 49 when he arrived in the U.S. The family came to Cincinnati, Ohio, where there were a number of German Catholics. They lived in Boone County, KY, across the river from Cincinnati, and then bought land outside Lawrenceburg Tennessee, and moved there with their families in 1871. According to Kathleen Sudduth Niedergeses, who obtained this information from the church they attended, two of the children died before they reached Lawrenceburg. Gertrude Paulina Feldhaus was born on 12 October 1856 in Roxel, Munster, Germany, and was baptized on 14 October 1856 in Roxel, Munster, Germany, by the church Chaplain Baune. She died between 1868 and 1871 in Kentucky or Ohio, and is buried there. Johann Bernard Feldhaus was born on 8 July 1863 in Roxel, Munster, Germany, and was baptized on 11 July 1863 in Roxel, Munster, Germany, by the church Pastor Poppe. He died between 1868 and 1871 in Kentucky or Ohio. Bernard Heinrich's daughter Annie Feldhaus, photo below, married Joseph Sutter August 27, 1882 in Lawrenceburg. 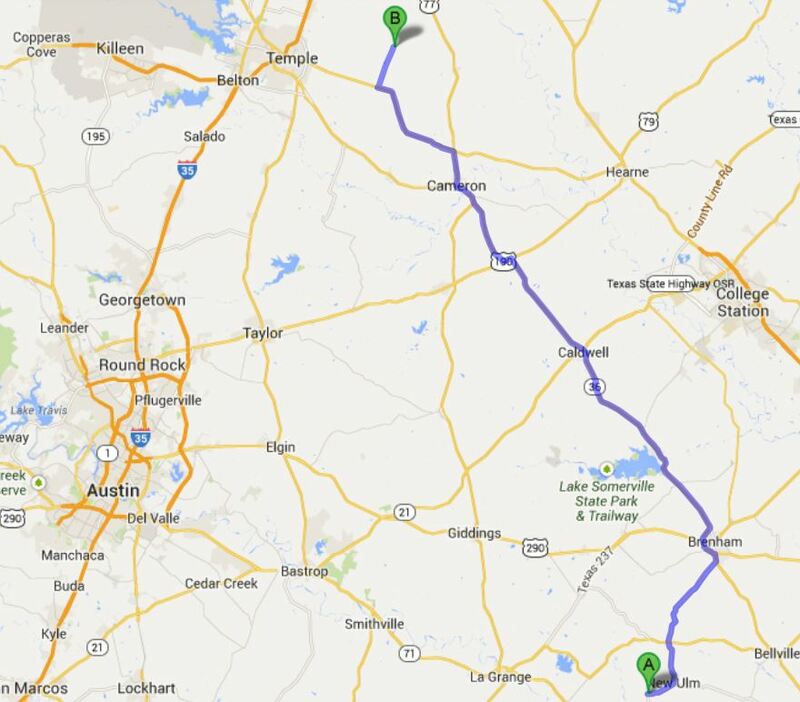 On 15 August 1884 Annie, Joseph, and Henry's parents moved to Wesphalia, TX. I believe they were drawn to the town by the large number of Germans who had immigrated from their home, Westphalia, in Germany, finally settling in this area. In 1879 several immigrants from the Westphalia province in Germany moved from Frelsburg Texas ("A" in the map above) into the area they named after their homeland province, Westphalia ("B" in the map above). There were thirteen families on 270-acres of homestead plots by 1884 when Annie arrived with her husband and parents. 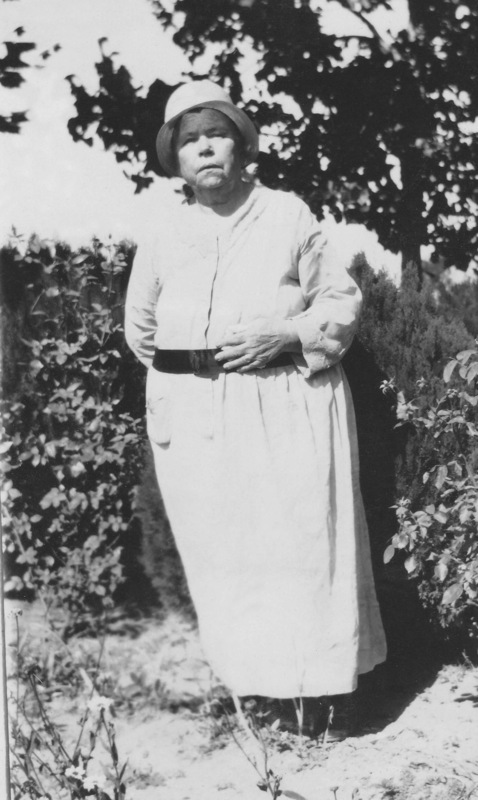 Annie Feldhaus was born 25 February 1859 and died on 13 June 1935. She is buried in the Sacred Heart Catholic Cemetery, Lott, TX, about ten miles north east of Westphalia. Annie's children are John Henry Maria, Henry Bernard Joseph, Hohn Melchoir William, John William Maria, Franz Joseph, Hermann, Joseph Henry Alfons, Henry Anthony, Alfons Alois, Bernard Alois, and Anna Maria. Following is the information from the St. Mary's Cemetery. Soon after they settled in the area, Westphalia's first families named their community after the Westphalia province in Germany from which many of them had immigrated. They began having Sunday prayer meetings in the home of Theodore Rabroker, the first settler. These were times of worship and fellowship, and because they were pleased with the soil and location, the German natives purchased 100 acres of land for a church and school. Their efforts were thwarted, however, when the first two structures were destroyed by storms in the early 1880's. During a meeting on Christmas Eve in 1893, Rev. Michael Heintzelman recommended building a new and larger church. After Rev. H M. Simoni drew the plans and Andreus Fuchs of Tours was hired as contractor, work began shortly after the new year. All the stone for the foundation was shipped by rail to Lott from a quarry in Muldoon, Texas, and the timber was brought from Waco. Parishioners volunteered to haul, without charge, all building materials from the nearest railroad. As many as 80 loads were hauled with wagons from Lott in one day - a distance of eight miles. The church was designed in the shape of a Latin cross with a bell tower on each side of its center area, it measures 120 feet long and 52 feet wide. To tolerate a strong wind, six inches of sway was built into the towers. The towers are covered with copper sheeting and each is topped with a nine-foot stainless steel cross. The middle section carries a six-foot cross. The church contains more than 20 stained glass windows, all shipped to Westphalia from Germany. The largest stained glass window is directly the main altar and depicts the Visitation of the Blessed Virgin. The two side windows depict images of St Monica and the Archangel Michael. The main altar was purchased for $700 and was shipped from Germany. The 11-foot pews are pine, and are hand planed and hand joined with screws. Several pioneer families donated three large bells in the towers. 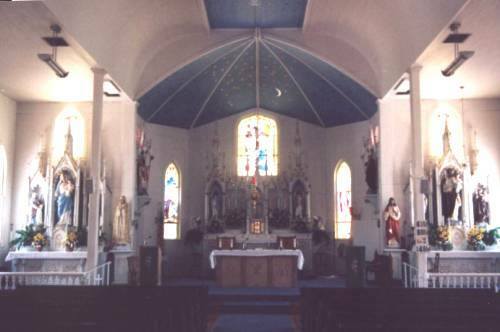 Interior painting and decorations were originally done by H. A. Sokolowski, an artist From Bernardo Prairie, Texas. The Church of Visitation was completed in February of 1895 at a cost of $8,000, as most of the carpentry was done by parishioners. The Most Rev. N. A. Gallagher, D.D., Bishop of Galveston, dedicated the new on May 23, 1895. In 1914, a large, arched, dome-shaped structure was added to the east end of the building, enlarging the sanctuary. Donated by Mrs. Theresia Bockholt, the large pipe organ was built in St. Louis, Missouri, in 1914, by Kilgen and Son, Inc. The choir loft was enlarged and the organ was installed in March of 1921. It was refurbished in 1979 and is played each Sunday as well as on special occasions. 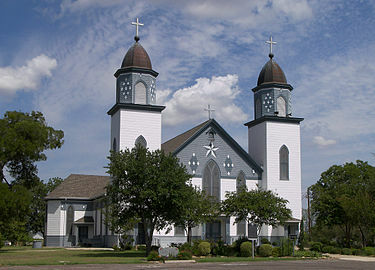 On December 31, 1978, the historical Church of the Visitation, one of the largest wooden churches in the State of Texas, received official recognition with the erection of an official Texas Historical Marker. On May 15, 1996, the community was recognized as a Rural Historic District, which encompasses 5,500 acres of farmland, the church and many other historic sites in the area. The district is now listed in the National Register of Historic Places. The religious character of the community is evidenced from the 14 priests and 38 sisters who originated from the community. Today, the parish consists of 185 families with 500 parishioners. Just as in the beginning, the church continues to be the center of all community activities. The annual homecoming and picnic is held the second Sunday of October each year with a chicken and sausage meal along with games and fun for the entire family. This event provides the major support for the church. Contributions are always accepted to defray expenses of maintaining this historic church. Westphalia is dissected by State Highway 320, the shortest state highway in Texas, in western Falls County. In the summer of 1879 several immigrants from the Westphalia province in Germany moved from Frelsburg, Texas, into the area. Early settlers included Theodore Rabroker, John Bockholt, Casper Hoelscher, Frank Glass, Fritz Schneider, and Theodore Schneider. 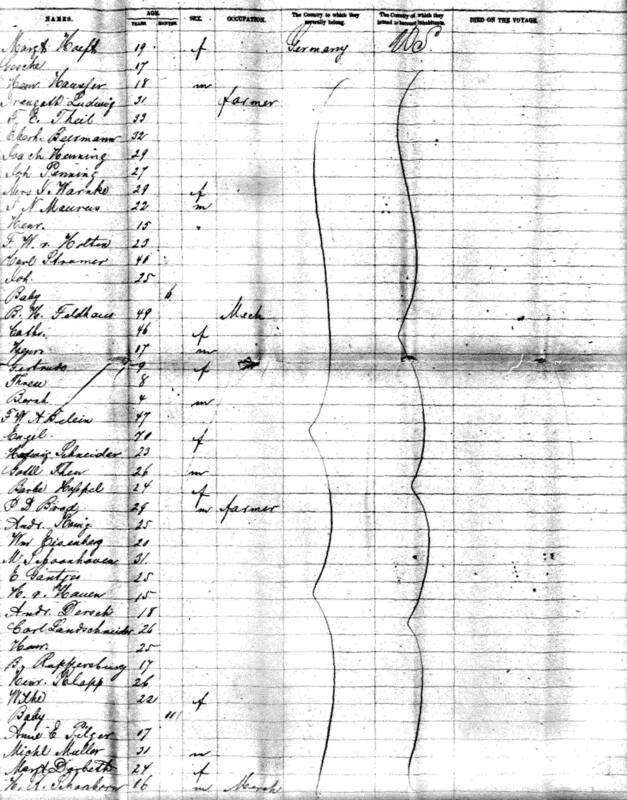 There were thirteen families on 270-acres of homestead plots by 1884. The Church of the Visitation was completed in 1895 on 100 acres of land high on a hill, and its picturesque twin towers can be seen for miles. A three-room school was constructed in 1896 and operated as a parochial school until 1935, when it was consolidated with the public school. The school received a historical marker in 1982 and in 1989 held classes for kindergarten through eighth grade. The post office and the first store were opened in 1887. P. A. Heckman was the first postmaster. The post office was closed in 1906, and mail was sent to Lott. Westphalia had four businesses and a gin in 1892. By 1933 the population was 100; it was 300 in 1964, and in 1990 it was estimated at 324. The population dropped to 186 in 2000. The following documents have to do with the release of Bernard Heinrich Feldhaus from the German military service and granting permission for him and his family to emigrate to the United States. I received this document from my mother. The undersigned royal government does hereby verify, that the bricklayer Bernhard Heinrich Feldhaus, born November 28,1818 to Roxel district Munster, where ha is also living now, has granted permission for leaving the Prussian subject ship of the community as he requested for emigration to North America with his wife Catherina Holtstiege (maiden name) born September 16,1821 and his children. The certificate of discharge declares for those persons whose names are listed, that the rights of being a Prussian subject have been taken away from the moment this document is received. The owner of this document, the foot-soldier Bernhard Heinrich Feldhaus called Hobbelts from the first battalion Munster 13th militia-Regiment was born in Roxel district Munster, deserves the service honor, which is donated to the militia by the king subjects, on the l/16/1842. Bernard Heinrich Maria, the legitimate son of the weaver Johann Heinrich Veldhus called Hobbelt and of Cathrina Gilmans was born 11/28/1818 and baptised on the 30th, Godfathers: Bernard Heinrich Kramer and Mar. Cath.. Zumbrock, maidenname Brincks..
Maria Catharina the legitimate daughter of the weaver Johann Heinrich Holstiege and of Theresia Wulf was born 11/15/1821 and baptised on the 16th. Godfathers: Maria Christina Wulf and Johann Heinrich Reifke. The son Bernard Heinrich Feldhaus (look Velthus) married with the agreement of the mother in the age of 31 years the daughter Maria Catherina Holstiege in the age of 28 years. The wedding was on the 11/6/1849. Witnesses: Henrich Brinkert and Friedrich Holstiege. 1) Bernard Heinrich was born June 8th 1850, baptised on the 9th. Godfathers; B. H. Holstiege and M.A.Volker, lady Feldhaus. 2) Gertrud Paulina was born October l2th l856, baptised on the 14th, Godfathers: Gertrud Feldhaus and brother Wilhelm Feldhaus. 3) Anna Theresa was born February 25th l859, baptised on the 27th. Godfathers: Bernard Heinrich Kramer and Theresia Wulf, lady Holstiege. 4) Johann Bernard was born July 8th 1863; baptised on the 11th, Godfathers; Johann Bernard Brinkert and Dina Holstiege. Compendium for non-industrial activity out of the ministery register. The owner of this, Bernhard Heinrich Feldhaus called Hobbelt. from the 7th Company of the above named regiment from Roxel district Munster of the administrative Munster 5 feet 6 inches tall with strongly built body and fair hair was born November 28,1818. Entered the military for an active service on the first of November 1838 and reached till now an active service time of one year and eight month, was released with unlimited vacation to Roxel. district Munster and while he shouldn’t be drafted to his old company, he will switch over to the first draft of the militia on November 1st.1843. After arriving at the before named town chosen by him he has to present himself at once to the first sergeant of this militia district and show this document. Also to leave this area like to travel he has to report every time. He is allowed to leave his district but he has to announce this to the first sergeant of the old and the new district, in which he wants to live. The foot - soldier L. H. F. called Hobbelt born November 28th 1818 in Roxel district in the administrative district Munster is dismissed to the veteran reserve from now on after going through the time of compulsory military service. The militia man B. H. F. called Hobbelt November 1st 1838 from Roxel born in district Munster administrative district Munster is with this dismissed to Roxel d.M. d.M. and has to give notice to the district sergeant with this record at once. 1. The military man is allowed to leave his home town without anouncing it within the first four weeks, if there is to be no roll-call or no drilling in this time. In the last case or if he stays away longer than four weeks he has to inform his sergeant. He can change without problem his residence within the border of this state, but he must announce every move, in the company from one town to the other, to the Sergeant and he has to give a report to the sergeant of the new district within 114 days. 2. Every announcement can be made written or spoken or through the magistrate, but the passport has to be sent with it for recognition. If a military man makes his announce­ment in the written form, he must write on the address “ militia-announcement “ and the letter must be stamped with the village police seal, then the letter has the right to go by mail. The presenter of this the B.H.F. called Hobbelt from the 7th company of the above named regiment, from Roxel district Munster in the administrative district Munster. 5 feet 6 inches tall with the normal to large build and the fair hair, who was born November 28th 1818 and entered the active military service November 1st 1838 and who has reached now an active service time of one year and eight months, hasn’t been punished in this time and has shown a good behavior and is trained well as a soldier.